There's probably no greater symbol of the global financial collapse than London's Bishopsgate Tower, aka the Pinnacle. The building has sat unfinished for years, a stump-shaped reminder of 2008's presumptuous boom and flailing bust. Now, construction is set to resume—but is it a triumph or a warning? According to a report from The Independent, the tower's new owners have completed a year-long design review, and pending city approval, construction may be poised (paywall) to begin once more. Before the crash, Bishopsgate was sold as the pinnacle—literally—of London's financial district. "It comes right at a time the market only sees every 10 to 12 years—it's destined to be a great success," trumpeted an unintentionally cringe-inducing 2006 promo video. "International business at its peak! Power players!" But in the years that followed, construction came haltingly—then, finally, stopped. 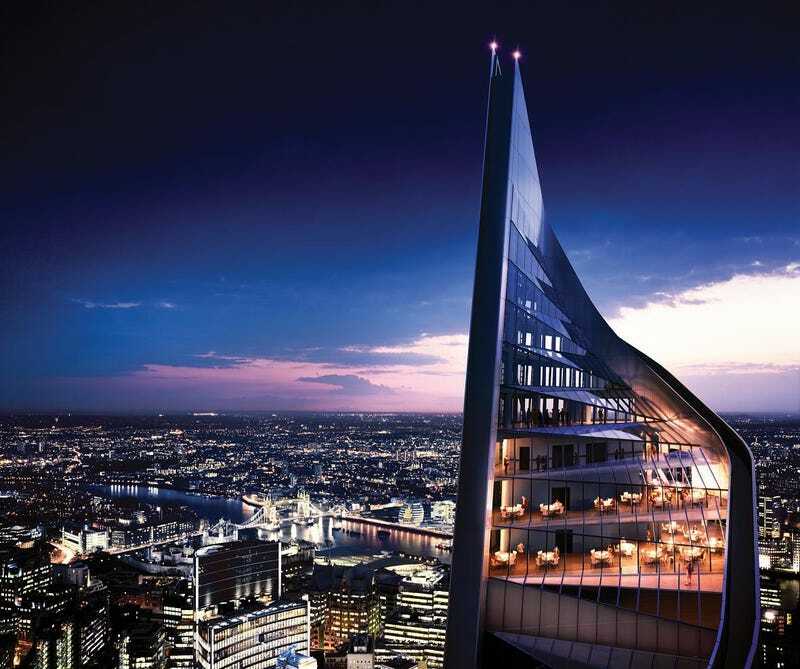 The Pinnacle has sat abandoned in downtown London since then, until Saudi Arabia's Economic Development Corporation purchased the seven-story half-building for roughly $325 million dollars in 2012. It initiated a redesign with a new architect—KPF—with the intention of restarting construction. The stalled tower. Image: Oli Scarff/Getty Images. It's pretty unusual for a stakeholder to insist on a year-long redesign of a building that's already underway. But the tower was largely hamstrung because of its bizarre design: The original plans called for a twisting vortex of steel that culminated in a penthouse that looked like a cross between a Tim Burton movie set and a badly-rolled blunt. As the great architectural reckoning has progressed this year, some speculated that Arab Investments would tear down the stump and rebuilt a new, more basic tower. They even had a name for it: The Austerity Tower, a "... monolithic grey block topped with a bust of a sombre-faced George Osborne," joked Londonist. "Or perhaps it will take the form of a series of declining zig-zags resembling Britain's growth figures in the age of austerity." But if The Independent is correct, the original design is going to remain pretty much intact. Why? Because as London enters a new boom, time is of the essence. "I gather the main reason was that the developers didn't want to back with a fresh planning application," says once source. So, almost a decade after it was conceived, a new boom is breathing life into London's great white whale of a skyscraper—which is good news for the neighborhood. But could it also, as the Skyscraper Index tell us, serve as a warning that we're reaching the apex (or nadir) or another unstable boom?